Google is apparently preparing its own entry in the growing Android tablet competition. 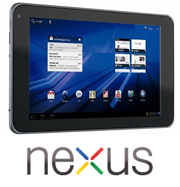 Reports say Google is working with LG on a Nexus-branded tablet running the Android Honeycomb 3.0 software. The tablet could ship as soon as this summer, according to tech pundit Eldar Murtazin, writing for Mobile-Review [translation]. Google first partnered with HTC to create its own brand smartphone, Nexus One, which is now retired. Then Google paired with Samsung for the successor Nexus S, also running the latest version of Android at the time. Given Google's history of teaming up to manufacturers to release phones under its brand, it's indeed possible a Nexus tablet developed in partnership with yet with another manufacturer (LG) is coming up to shape the Android tablet landscape. Besides projecting release in either midsummer or early fall, Murtazin did not detail any specifications on the rumored Nexus tablet. But if past experiences with the Nexus One and Nexus S are any indication, the Nexus tablet would come preinstalled with a new version of Android Honeycomb 3.X. Like the Nexus S, Google would also sell the tablet direct to consumers, or via subsidized deals from wireless carriers -- if the tablet will have 3G/4G capabilities alongside Wi-Fi. LG is also preparing its own Android tablet, the G-Slate, with an 8.9-inch screen and 3D features, priced at $529 from T-Mobile. Running on a dual-core 1GHz processor, the G-Slate has two 5-megapixel cameras on the back to record 3D video, but requires special glasses to view 3D content on the G-Slate. The tablet will run Android 3.0 and come with 32GB of internal memory. Another interesting tidbit of information from Muratazin's report could be bad news for owners of Android 2.X tablets like the original Samsung Galaxy Tab. Apparently Google's licensing agreement with manufacturers specifically prevents them from upgrading the smartphone-oriented Android 2.X to tablet-optimized Android 3.0 Honeycomb. If true, the rumor of the Android 2.X tablets not being able to upgrade to Honeycomb could also affect some other tablets expected later this year on the market. One notable example is the HTC Evo 4G (the stateside version of the HTC Flyer), which HTC said it will come with the Sense interface, on top of Android 2.3. But it is yet to be seen whether it will receive at some point an update to Honeycomb or not.